Japanese castles were the military, political, and economic centers of an area, and were ruled by a Lord. Hikone Castle is a well-preserved example of such a castle as it was not only a military hub in that it had defensive structures, such as a main keep and moats, but was also a political and cultural center with a day palace and residence for the local Lord; as well as an economic center with its base in the castle town. The balance turret (tenbin yagura) is so-named for its unusual shape, resembling a pair of balance scales. The area to the west of the main castle tower is called Nishi-no-Maru, or the west-wing fort. This three-storied turret is built at its west end, atop a 10 meter high stone wall. The drum turret (taikomon yagura) forms the last gate leading to the main bailey (an enclosed courtyard) , and is so named because it housed a great drum, used for communication across the castle grounds. Even today, this bell tolls five times a day to announce the hour to those within hearing distance. This was once the location of Hikone Temple, constructed long before Hikone Castle in 710 by Fujiwara Fusasaki, a government official. The Yamazaki Enclosure is so named because it stands at the highest point of the hill (“yama,” or mountain). While today this area is a beautiful grove of plum trees, many years ago it was the location of storehouses for rice. This rice represented not only food, but the Ii family’s great wealth: the rice was their stipend from the shogunate, counted in a unit called “”koku,”” which represented the amount of rice required to feed one person for a year. The stipend for the Ii family’s territory was valued at 300,000 koku. 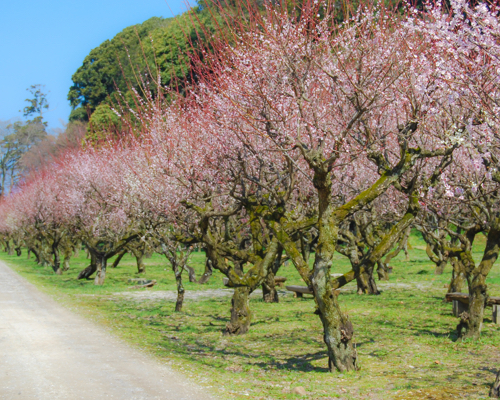 Today in the plum grove, about 450 pink or white plum blossoms can be seen annually from mid to late March. The trees were planted in commemoration of Hikone Castle’s selection as one of the 100 Best Sightseeing Places in Japan. The stables at Hikone Castle are located near Genkyu-en Garden and the lord’s villa, near which the horses would be trained and were cared for by workers known as “uma-yaku,” who also assisted the castle lords when they rode. A beautiful pleasure garden beside the castle lord’s residence, Genkyu-en Garden was built around a large pond with features such as islands and inlets joined by bridges, and was designed to be walked through. 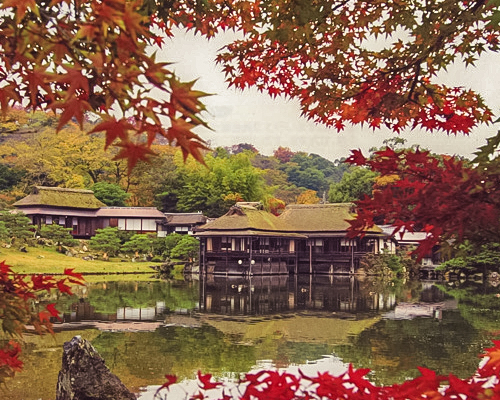 The lords of the Hikone Clan entertained their most distinguished guests at the guest house, known as Hosho-dai, which commands a fine view of the entire Genkyu-en Garden and the castle’s main keep. 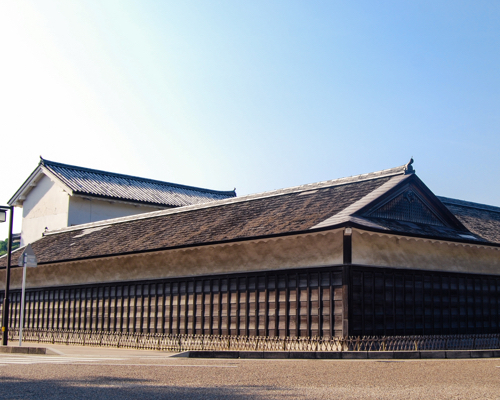 This palace was built in 1677 by Naoki Ii, the 4th lord of Hikone, as his second residence. 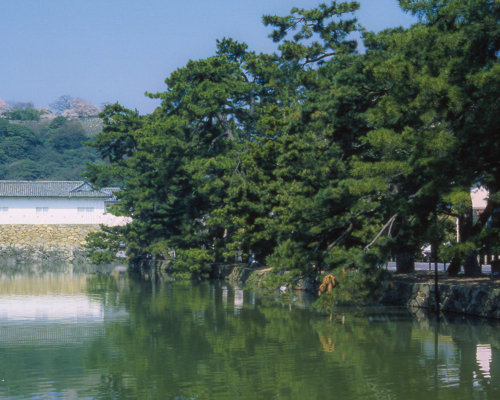 Visitors to Hikone Castle via the Iroha-matsu Pine Avenue will see the turrets of this wall across the moat as they approach. These pine trees line the avenue along Hikone Castle’s outer moat and the avenue leading to the Sawaguchi Tamon Turret. 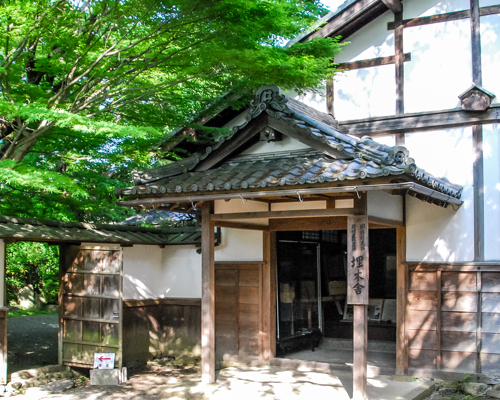 This is the lodge where Naosuke Ii, the 13th lord of the Hikone Clan, spent his days in ascetic style from the age of 17 to 32, applying himself to the pursuit of learning and martial arts. The balance turret (tenbin yagura) is so-named for its unusual shape, resembling a pair of balance scales. 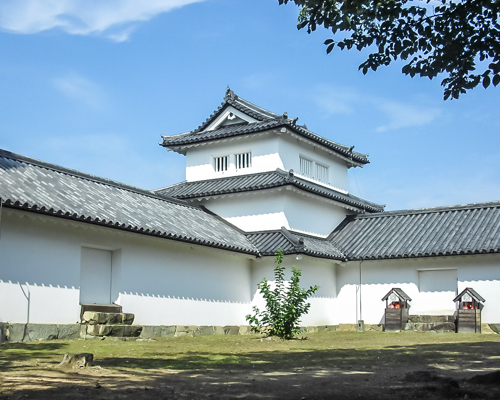 The particular shape of fortified storehouse, with its balance of both beauty and strength, is unique to Hikone Castle. As you ascend the slope from the castle’s front gate, you’ll find the the two turrets of the structure, and a bridge stretched between them, forming a sort of corridor beneath. The corridor bridge was made to be swiftly demolished in emergencies. The balance turret has been repaired many times over the years, and was repaired right down to the stonework foundation in 1854, leaving its left and right bases with two distinct styles of stonework. The base to the right uses an older style, called “uchikomi hagizumi,” while the base to the left uses the 19th century “otoshizumi” style. 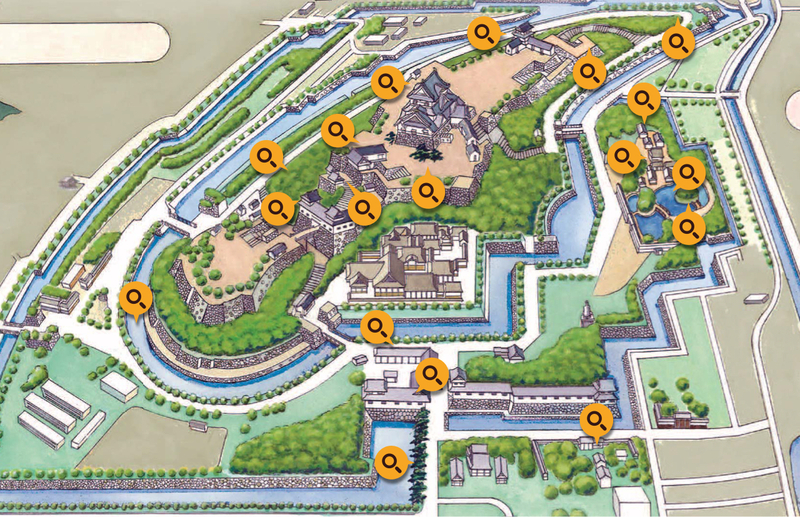 The area to the west of the main castle tower is called Nishi-no-Maru, or the west-wing fort. This three-storied turret is built at its west end, atop a 10 meter high stone wall. Just to the east of the turret is a grove of cherry trees, which is always very popular in the springtime for its exquisite blossoms. The drum turret (taikomon yagura) forms the last gate leading to the main bailey (an enclosed courtyard) , and is so named because it housed a great drum, used for communication across the castle grounds. On the left side of the drum turret runs a high wall cut from the natural rock, while on the eastern side there is no wall, but instead a high handrail that runs between the turret’s supporting pillars. This is thought to give better acoustics for the drum. Even today, this bell tolls five times a day to announce the hour to those within hearing distance. 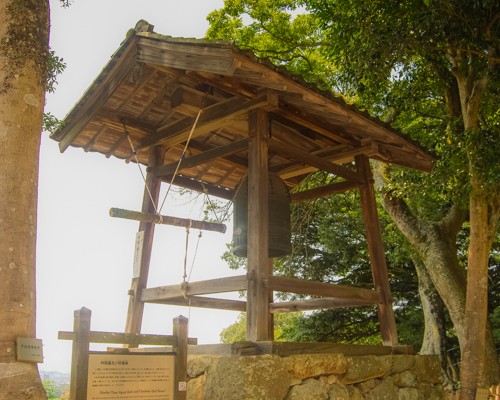 In 1844, the bell was moved to its present higher location near the main keep by Hikone’s 12th lord, Naoaki Ii, that the sound of its tolling could reach the entire castle town. The bell was known as the “Bell on the Mountain” by the townspeople, who would first hear its sound at 6:00 a.m, and again throughout the day at 3 hour intervals. This was once the location of Hikone Temple, constructed long before Hikone Castle in 710 by Fujiwara Fusasaki, a government official. The temple was built here to house a tiny statue of Kannon, the Buddhist Goddess of Mercy. Though the statue itself stood only 5.4 cm (2 in) tall, it was said to have stood respelendent atop a golden tortoise, and even rumored to cure diseases of the eye. Word of the Kannon statue spread as far as Kyoto, and it is said that amongst the many visitors to the temple atop Hikone Hill were the Emperor Go-Shirakawa and his ministers. The Yamazaki Enclosure is so named because it stands at the highest point of the hill (“yama,” or mountain). This area of the castle was formerly the estate of Kimata Morikatsu, the Ii family’s chief retainer. Nowadays the Yamazaki Enclosure is a quiet space surrounded by trees, and provides a relaxing environment throughout the four seasons. 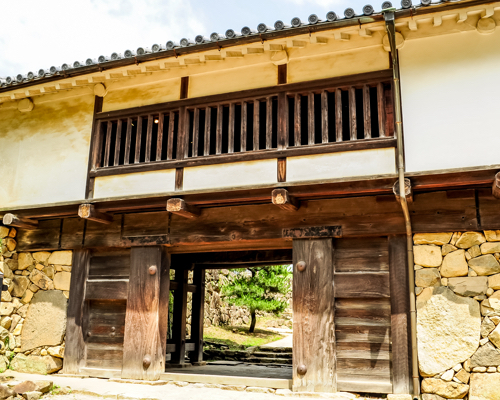 The stables at Hikone Castle are located near Genkyu-en Garden and the lord’s villa, near which the horses would be trained and were cared for by workers known as “uma-yaku,” who also assisted the castle lords when they rode. 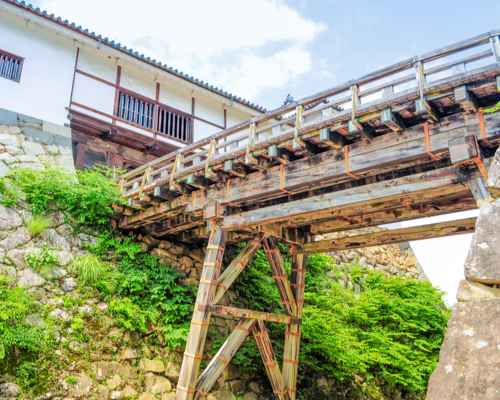 These are the only remaining stables within the grounds of a castle anywhere in Japan. The garden was constructed in 1677, and modeled on the detached palace of Emperor Genso of the Tang dynasty in ancient China. 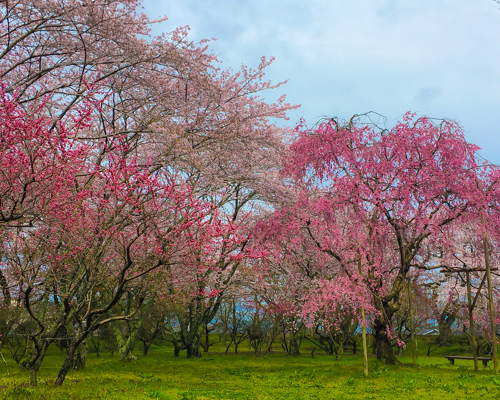 Genkyu-en changes its appearance throughout the year, with its brocade of blossoms in spring, the singing of cicadas in summer, the changing of colors of the autumn leaves, and snowscapes in winter. 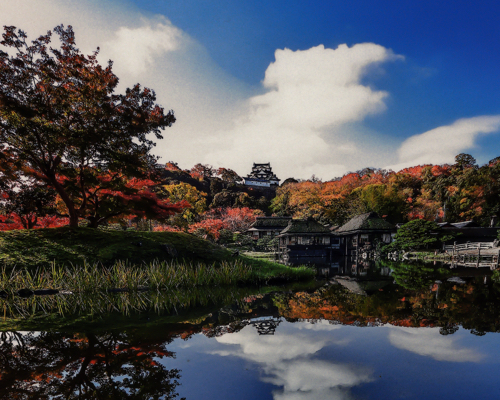 The lords of the Hikone Clan entertained their most distinguished guests at the guest house, known as Hosho-dai, which commands a fine view of the entire Genkyu-en Garden and the castle’s main keep. A mild green tea and Japanese sweets are served to visitors at the guest house. 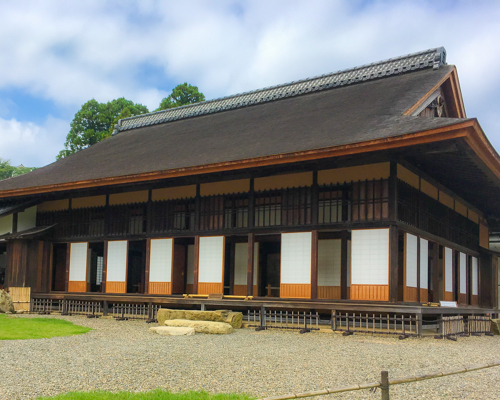 This palace was built in 1677 by Naoki Ii, the 4th lord of Hikone, as his second residence. After Naoki’s death, laws limiting expenditure forced the villa to be downsized. Its current size is said to be a tenth of the original. 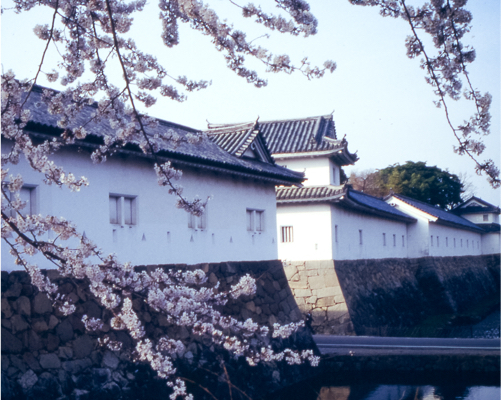 Visitors to Hikone Castle via the Iroha-matsu Pine Avenue will see the turrets of this wall across the moat as they approach. Originally constructed in 1622, the left turret was rebuilt after a fire in 1771, while the right turret is a concrete replica constructed in 1960 on the 100th anniversary of the assassination of Naosuke Ii, who was murdered by political opponents beside a castle gate in distant Tokyo. These pine trees line the avenue along Hikone Castle’s outer moat and the avenue leading to the Sawaguchi Tamon Turret. Trees were not typically planted along moats, because they offered convenient cover for enemies attacking the castle.